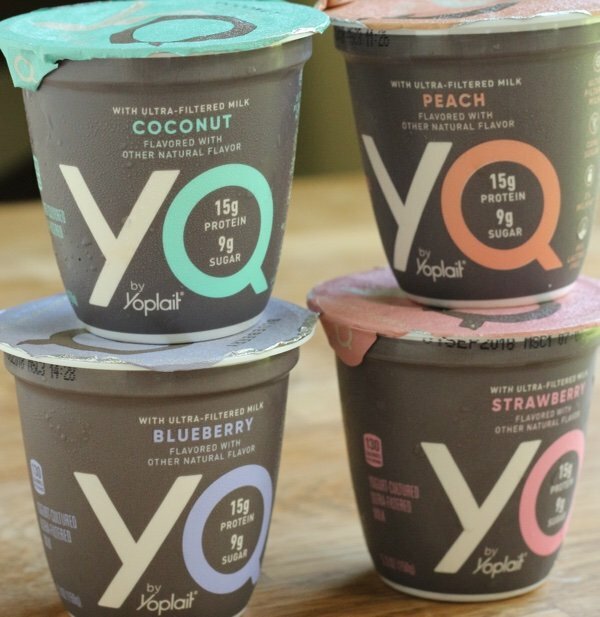 Chobani Greek Yogurt and YQ by Yoplait have something big in common. The companies know that regular yogurt is packed with too much sugar. I TOLD them. This isn’t me being funny. Chobani stopped talking to me after I told their product development people to cut the sugar. That is what they get for inviting me to their plant in New York State. TOO MUCH SUGAR in yogurt is one of my rallying cries. General Mills, creator of Yoplait and YQ, has never asked my opinion but they know the score. I was wandering in the yogurt section of my supermarket when I saw a couple of yogurts that I hadn’t tried and so I thought it was time to dive in again into the yogurt wars. 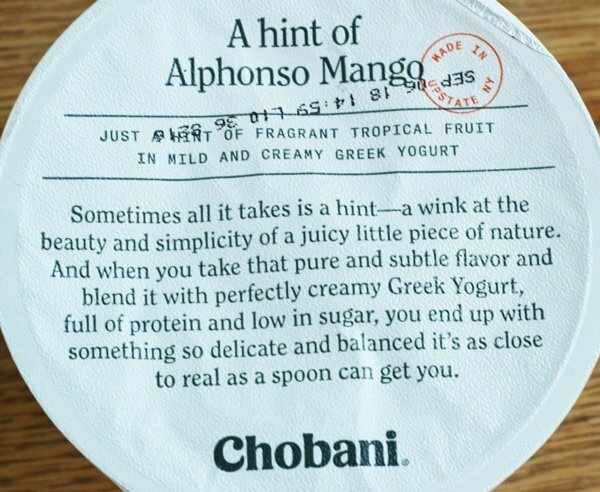 This is a Chobani that features a HINT of flavor versus a full on slam dunk of flavor. I think the idea is to prepare you for the yogurt flavor that comes when you don’t overwhelm the product with sugar. As you can see they are advertising “low in sugar”. I think it is funny how they say “as close to real as a spoon can get you”. Does that make any sense? Did they just want to put “real” in a sentence? There is added sugar here and I would guess that it is around 4 grams (a little less than a teaspoon). While it is not as good as Siggis no sugar added – it is far better than the old days of 21 grams of sugar in yogurt. There is no added stevia or sucralose or chicory root fiber and you can tell because it tastes really good. The chalkiness of Greek yogurt is somehow gone and the flavor is subtle. It tastes like yogurt – not dessert – and it is creamy. My family liked this a lot and it is at a friendlier price point than the Siggi’s. I am giving this an A- and maybe Chobani will start speaking to me again. Another entry into the lower sugar division is YQ made my Yoplait. 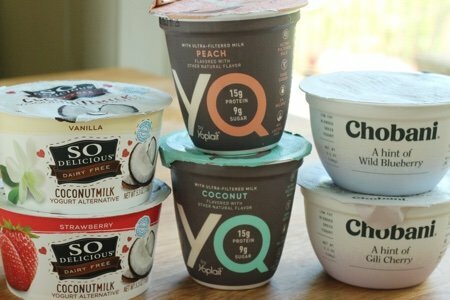 I didn’t understand the name – I thought it was called YO until my daughter pointed out that it is a Q next to the Y.
YQ is a play on IQ and I believe you need a high IQ to understand why they are promoting “ultra-filtered milk”. The filter is used to lower the amount of natural sugar so it keeps the protein and calcium but has less sugar than regular milk. I would know that because I am a yogurt expert with an average IQ. I guess what they are saying is that it is not Greek yogurt. Greek yogurt is strained to make it high in protein. Why you would filter out sugar AND THEN ADD SUGAR BACK is beyond me. But that is what they did. Honestly, this was one of the worst yogurt products I have ever tasted and I have tried it all. Do the people at General Mills taste what they create? It is truly awful. The texture was strange and the flavor was bizarre. It actually tasted too sweet. I don’t know what I can say except that it must be over engineered to some degree. It doesn’t work and I feel bad being so harsh because I know Yoplait worked hard to develop it. Finally, I saw this and decided I would give it a try. Coconut milk yogurt!! 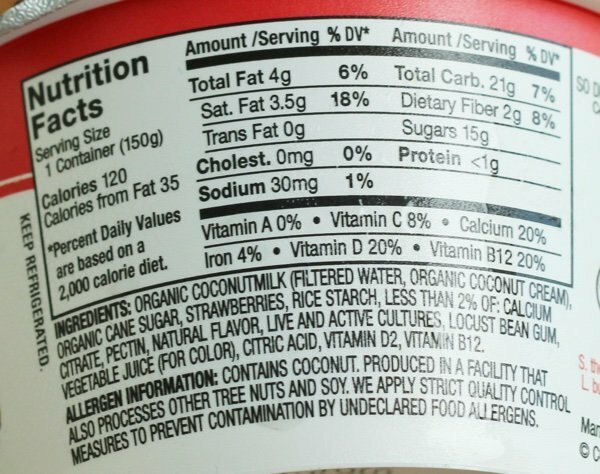 I was thinking that coconut milk was a good choice because it is naturally low in sugar. No filtering needed! This was a very unusual yogurt – if you want to call it that. It was more like a custard. 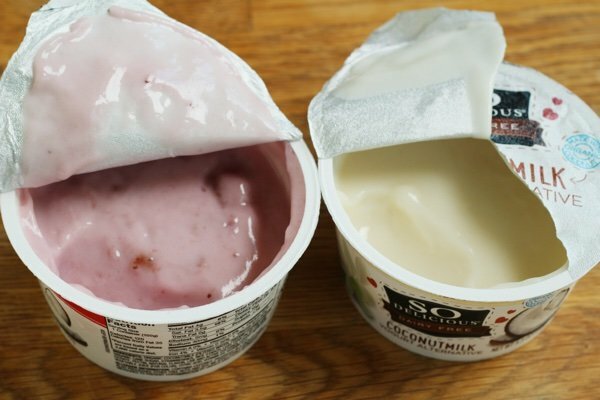 It did have live yogurt cultures but they didn’t turn the coconut milk into a yogurt that I recognized. I like this for dessert. I thought it was good if you called it “pudding” – it would make sense. So Delicious should market it is an all natural, sweet, delicious dessert next to the crappy puddings. Not wasting my sp on these products. Just add some real fruit to Fage 0% plain greek yogurt and some cinnamon. I add one or two .4 oz packets of Strawberry/Banana/Orange Crystal Light powder to a large container of Costco fat free yogurt. Delicious, and add fruit to that. Zero Points on Weight Watchers. Yuck. I remember the first time I tried yogurt. My grandmother let me taste one of hers. It was so tart, the way yogurt used to taste before they messed it up with all the additives & sugars. This was way back in the day,'70's maybe? I have my 2 point yogurt each morning. I would rather indulge in a dessert than eat one of the above. 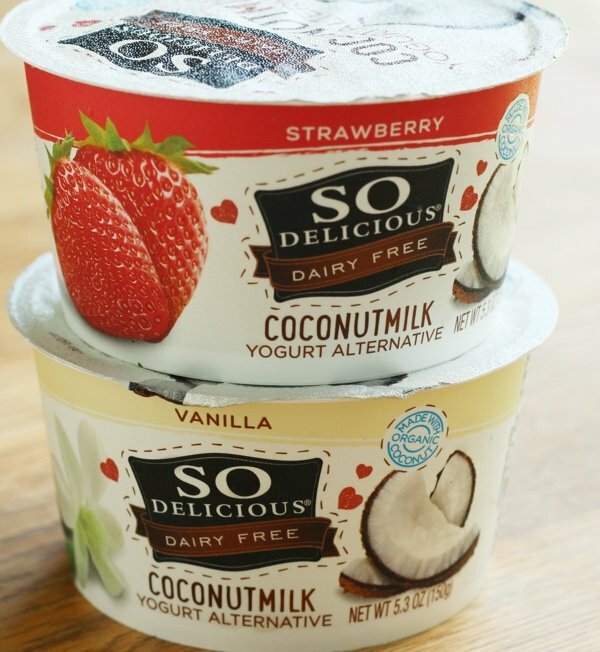 I’m looking for a good tasting vegan yogurt that’s not made from coconut, I’m not very fond of coconut. Any suggestions! I'm with Laurie and Travers - not wasting SP on these. Like they said, way better off adding my own fresh fruit or zero SP flavorings. Frances, had you tried soy (Silk)or almond milk yogurts? I've seen those in the supermarkets and some health food stores. I teach at corporate health fairs how to avoid becoming a diabetic. I look at sugar in all packaging—shopping at Walmart I choose Great Value (theirs) for 7g of sugar and 17g protein. Haven’t found any that beat that. Agree with the reader who mentioned about Fage o% with fruit and I add a little cereal. Sometimes I add a few spoonfuls of Oikos Triple Zero by Damon. It has about 6grams of sugar. They use a little Stevia-no fructose or sucralose. I love the Chobani w/ hint of vanilla/cinnamon and I usually add blueberries to it but I also do plan and add honey/fruit to it . . . this is convenient for me if I need a quick one that's ready to go but prob only eat 2 yogurts a week . . . is it partly lower in sugar b/c it's higher in fat? Feel like the fat free stuff often has more added sugar. 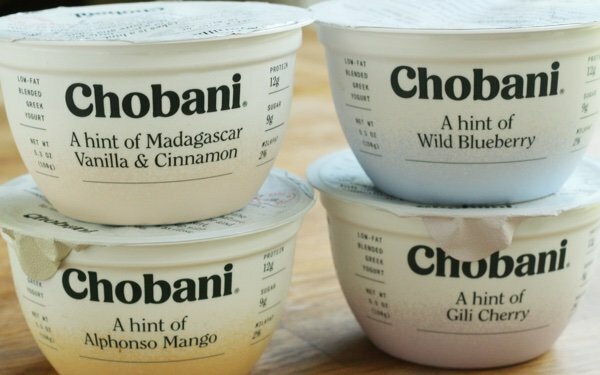 I need to try siggis but have also been finding the chobani for $1 each. I have started making my own Greek yogurt in a thermos and adding fruit as everyone mentions plus a bit of homemade granola. My recipe for Greek yogurt: heat 750 ml (3 cups) of milk to 180 degrees F, cool in fridge till at 90 to 100 degrees F, add 1/3 to 1/2 cup powdered milk and about 1/3 cup plain greek yogurt. Preheat a large thermos with boiling water ahead of time, emoty it and add the yogurt mixture. Close the lid and wait 8 to 12 hours. The longer you let it “work”, the tangier it gets. You will need a long skinny spatula/knife to loosen up the yogurt and then jig the thermos up and down forcefully to get the yogurt out. If you don’t add the powdered milk, you get regular yogurt which you have to strain to make into Greek yogurt. This way saves that step so you save LOTS of waiting time! I started doing this to cut back on my plastic consumption....enviro and health wise. I was in California recently, and went to a REAL yogurt place called Go Greek! OMG - DELICIOUS!!!! I looked them up on line, and unfortunately for me living in New Jersey, but fortunately for any of you who live in CA, they only have them all over CA! This is what we need in the NJ/NY area!!! REAL delicious yogurt - they even had ones with NO SUGAR added! It was an amazing concept!! The YQ yogurt is 99% lactose free. That is the reason for using ultra-filtered milk. I only eat non-dairy yogurts but I almost never buy flavored or sweetened ones (I never did when I ate dairy either) . I just think they’re all too sweet. I but plain, un-sweetened So Delicious and, while it’s a bit thin, it’s ok for basic stuff like overnight oats or tzatziki sauce. Kite Hill makes a pretty good almond yogurt and Coconut Collaboratve makes a wonderful, super thick creamy yogurt but it’s hard to find. In the meantime I keep searching for the perfect non-dairy. I only buy plain unsweetened coconut yogurt alternative. It’s something you need to get used to because it is truly not sweet and it is not yogurt. I make my own “cereal” of toasted coconut and nuts sweetened with a little Virtue. I enjoy the cereal with the unsweetened So Delicious or some unsweetened coconut & almond milk or unsweetened chocolate almond milk. It works for me. I find it shocking that vanilla yogurt has so many more carbs than plain. I’ve also discovered that plain doesn’t mean no added sugar. I purchased Silk Almondmilk yogurt alternative labeled “plain” only to discover it contained 6 grams of sugar and tasted very sweet. Lisa I love your writing style! This made me laugh :) I'm with you - why do these companies RUIN yogurt??? Just give me plain Fage yogurt. Tastes like my grandmother’s homemade European yogurt of many years ago. This is the real deal. Not even ONE of the other commercial yogurts come close. Just add real fruit and/or cinnamon. Put it on a baked potato instead of sour cream. Create a salad dressing. Nothing compares to Fage plain yogurt, and I have tried them all. Actually the Plain version of the YQ is very good and has less sugar and high protein and a little fat for creaminess. Good for those that don’t like the tartness of Greek yogurt. Only 2 freestyle points and you can add your own fruit!! I'm with you, Rhoda. Non fat plain Fage works for me for all kinds of recipes. It's the base ingredient, for zero points. Use spices for a savory dollop, dressing or dip; use a flavor extract or add fresh fruit, etc for sweetness. Thank you for doing the research and the tasting for your subscribers/followers, Lisa!! So. I never comment but i must on this. Your "article" is so wrong on the YQ portion. Did you even reasearch at all or even read the label before you posted horrible misinformation on YQ and on ultra filtered milk? Nope. You didn't. First we love YQ here. The vanilla is amazing. It tates sooooo good. Best part, it's lactose free, well 99% LF. my family, except me, are LF so we've tried lots. It's also low in sugar and high in protein. Even better. I usually make yogurt in my instant pot, but when we travel, i can't, so this is perfect for my daughter for breakfast. I'd buy it all the time but it's $1.35 each here, kinda pricey. Second, there is WAY MORE to ultrafiltered milk than what you wrote. Mostly that it is lactose free. The main thing with UF milk.